Standard: 6/10 on the mobility scale (10 being the most demanding). General fitness required. There are stairs to the churches. We will have some walks, but nothing strenuous. Walks are on uneven rocky terrain, sturdy footwear required. If walks are too demanding there is always an option to skip the walk. Traveling to highland mountain regions up to 7500 feet elevation. We will expect late summer weather in the mountains, which means it could be anything. Prepare for temperatures between 50-85F, likely that we will have at least one rainy day. 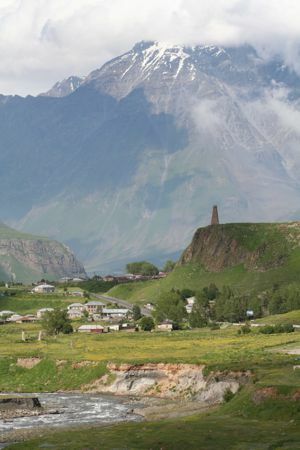 Schedule a 3-day private tour up the Russian Military highway to the highlands of Kazbegi! 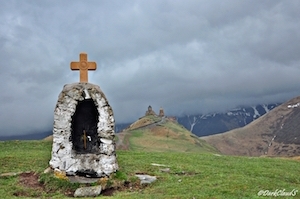 Schedule a 5-day private tour to Armenia! We begin and end the tour in Tbilisi, the capital of Georgia (airport designation TBS) and a beautiful city that featured prominently on trade routes from Asia to Europe. 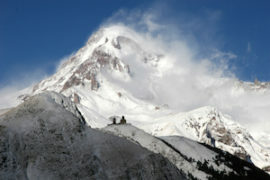 The focus of this unique itinerary will be the ancient, medieval, and modern architectural and cultural monuments to the West - the region of ancient Colchis on the Black Sea coast, and the mysterious gold-producing highland of Svaneti, where each village features a series of defensive fortress-like towers. In the hills above the Colchian plain, we stay in the city of Kutaisi, with its fantastic medieval Christian cathedral sites, National Museum, and spice market. This was a likely site for the capital of ancient Colchis, and has remained a vibrant city ever since, its fortunes rising and falling to coincide with the history of invasion and revival. 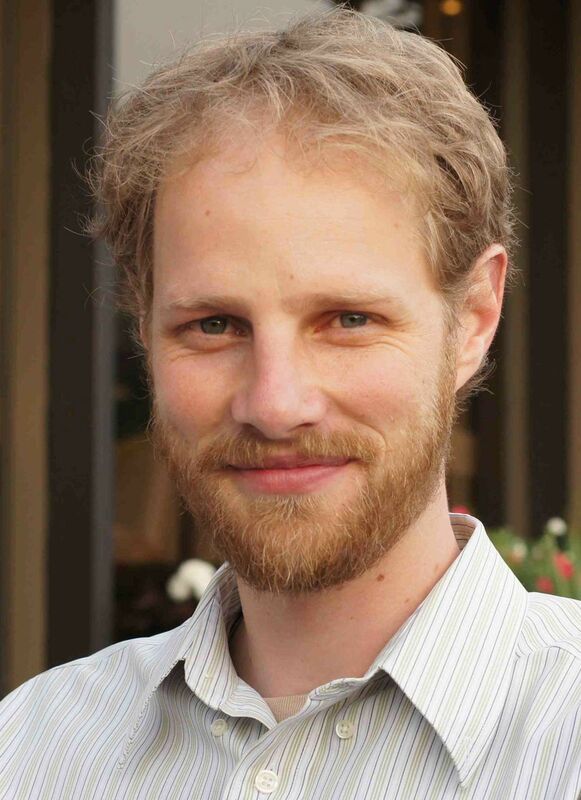 Our last two days will include a walking tour of the synagogue, mosque, baths, churches, and carpet shops of Old Town before a final banquet featuring the top-rated local cuisine of Georgia. This is a tour of sites, sounds, and tastes to thrill even the most seasoned travelers. Our dedicated team takes excellent care to locate and vet every hotel, restaurant, and transport for superior quality. Ancient seafarers plying the eastern shores of the Black Sea encountered misty and jungle-covered precipices plunging into the coastal beachheads. These were the lands of Colchis, an ancient kingdom that historians date to at least 1300 BC. 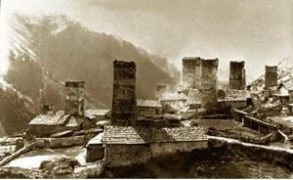 Strabo, a Greek historian himself from the Black Sea region, wrote about both Colchis and the Soanes, one of the first references to the allied highland tribes of Svaneti. According to Greek mythology, Colchis was a fabulously wealthy land situated on the periphery of the Greek world. Here, in the sacred grove of the war god Ares, King Aeëtes hung the Golden Fleece until it was seized by the Greek heroes, Jason and the Argonauts. Jason escapes with the fleece, and the princess Medea, only to be pursued by the Colchians to the fortress of Apsaros (Gonio). The Romans called Colchis the kingdom of Lazica-Egrisi, and we visit two sites from this period: Gonio fortress on the coast, and the Archeopolis fortress inland. 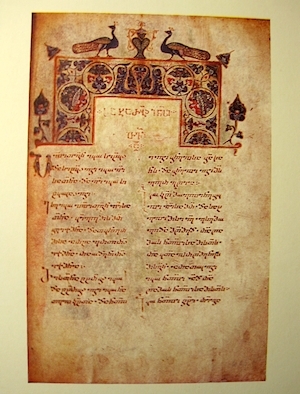 A unique language is spoken in former Colchis, Megrelian, which features a unique culture and folksong culture. 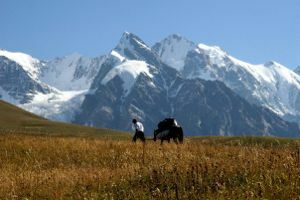 Traveling up a narrow gorge from the plains of ancient Colchis, the hidden valleys of Svaneti eventually reveal themselves among the snow-capped peaks of the Great Caucasus range. In the 19th century, famous alpinist-explorers such as David Freshfield and Vittorio Sella recorded their travels through the area. Speaking an ancient language only distantly related to the Georgian and Megrelian languages of the lowlanders, the Svans are a fierce and proud people who have preserved aspects of their ancient rituals and traditions to the modern day. Certainly their three-voiced polyphony is unique: it preserves an ancient tuning system that is at once vigorous, intoxicating, and ear-ringing. Iconic defensive towers from the 10-11th centuries lend a feeling that these villages have been frozen in time. But Mestia, the regional center, has been renovated to accommodate growing tourist demand, and now features modern hotel facilities and a ski resort. 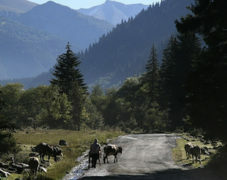 The neighboring highland region of Racha is described as the jewel of the Caucasus. Our main cultural destination there will be 12th century Nikortsminda cathedral which has the finest exterior stone-carving and interior wall-paintings in all of Georgia. Further into the mountains, we find a synagogue, one reminder of the pre-emigrant Jewish community that thrived in this highland region until their voluntary emigration in the late 1970s. 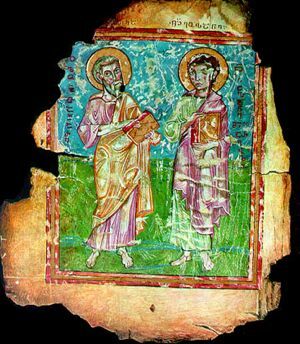 Georgia was one of the first states to convert to Christianity in the early fourth century, and it became an important socio-religious factor in the identity of Georgia as it struggled to survive against constantly invading empires. Many local legends describe the preaching of Apostles Andrew and Matias in West Georgia in the first century; Matias is said to be buried in the fortress of Gonio, and on the site where Apostle Andrew cut down a giant oak tree to prevent human sacrificies at Martvili, a seventh century limestone monastery marks the site. Certainly by the fourth century, Christianity had become stronger as a bishop from Lazica-Egrisi attended the First Council of Nicaea in 325 AD. Monasticism became an important expression of Christianity, with the monarchy and local aristocracy supporting the construction of fantastic cathedrals in the city centers and ornately carved monasteries in remote mountain valleys. + Starting in Tbilisi (named for the hot springs along the river), we journey upstream to the ancient capital Mtskheta. 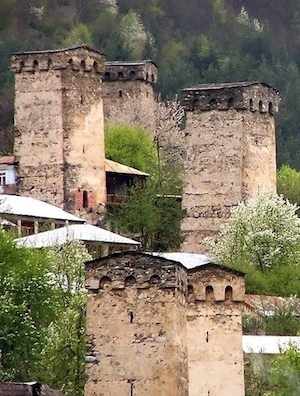 Dominated by the 11th century Cathedral of the "Living Cross," Mtskheta was once the thriving trade capital of East Georgia but is now a quaint little hamlet at the confluence of Mtkvari and Aragvi rivers. The Romans reached Mtskheta in 65 AD, as evidenced by the remains of a bridge left behind, and in the early Christian era, St. Nino the Enlightener worked miracles, converting the Iberian King Mirian and his queen Nana to Christianity in 337 AD. Further up the Mtkvari River, we visit the Ateni Sioni Church (7th c.), before leaving the valley to venture past the Surami Fortress and over the pass into Imereti-Samegrelo in West Georgia. + Historic Georgia was divided by the Surami mountain range into two kingdoms: Iberia in the East with its capital in Tbilisi, and Colchis in the West with its capital in Kutaisi. 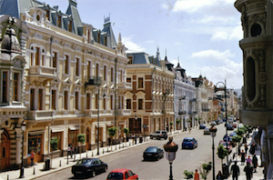 This historic region has also been variously called Egrisi, Lazika, and today is called Samegrelo. 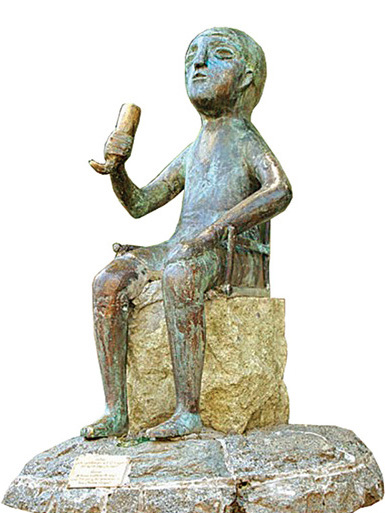 According to legend, Jason and the Argonauts sailed to the ends of the known (Greek) world, Colchis, to steal the princess of the land and its wealth of gold. Indeed, exquisite jewelry and weaponry was created by a cadre of artisans given access to the valuable mines in the high Caucasus, some of which is visible in museums today. 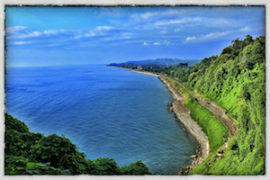 Our visit will include two nights in Kutaisi and two nights in Batumi, the coastal port city once inhabited by Roman traders. Sites include the ancient Georgian-Greek fortress city of Archaeopolis, the Roman fortress at Gonio (2nd c.), and the Kutaisi National Museum. From the Christian era we will visit the Martvili and Ubisa monasteries (7th-9th c.), the Bagrat cathedral (10th c.), the Gelati academy and monastery (12th c.), and the cathedral of Khobi. In Kutaisi, we encounter a synagogue, a remnant of the pre-emmigration Jewish community that thrived in this highland reach until the late 1970s. + Traveling up a narrow gorge from the plains of ancient Colchis, the hidden valleys of Svaneti eventually reveal themselves among the snow-capped peaks of the Great Caucasus range. In the 19th century, famous alpinist-explorers such as David Freshfield and Vittorio Sella recorded their travels through the area. Speaking an ancient language only distantly related to the Georgian of the lowlanders, the Svans are a fierce and proud people who have preserved aspects of their ancient rituals and traditions to the modern day. Certainly their three-voiced polyphony is intoxicating, preserving a unique tuning system without parallel in the world. Christianity spread to the region in the tenth century, where it thrived alongside animist traditions that remain in syncretism today. From this era, several chapels reveal a unique school of fresco painting, while the newly renovated National Museum boasts gold and silver icons from the 10th-14th centuries, four illuminated gospels from the ninth and tenth centuries, as well as priceless objects from many regions of Georgia spirited up to the mountains in times of war and protected there ever since. In each Svan village, defensive towers (10-11th centuries) protected each family from attack. These iconic towers dominate the hamlets, which seem frozen in time. But the capital city has been renovated to accommodate growing tourist demand, and now features modern hotel facilities and a ski resort. 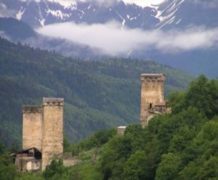 On our trip, we will visit several museums in towers, and stay in Mestia and Ushguli, two of the centers featuring some of the most historic towers in Svaneti. The neighboring region of Racha is the jewel of the Caucasus. 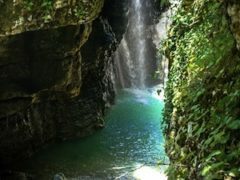 Its topography is dominated by massive limestone cliffs interspersed with clean rivers and lakes. Our main cultural destination is the unique, 12th c. Nikortsminda cathedral which has the finest exterior stone-carving in all of Georgia. In one of the farthest villages in Racha, we find a single valley dedicated to highland viticulture.